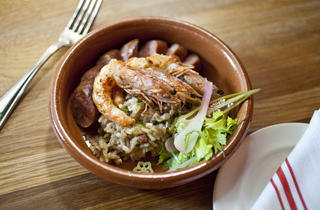 New York restaurants elevate rice from side dish to main course, showcasing risottos, paellas and more. 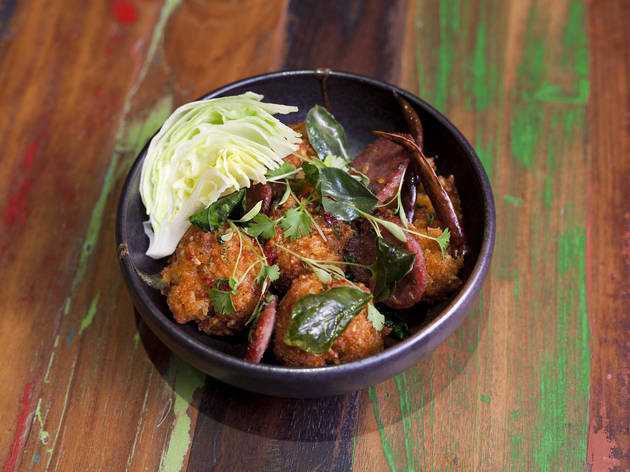 Photograph: Jessica LinNam khao (crunchy coconut rice) at Khe-Yo In his home country of Laos, rice is eaten and shared by hand, a tradition that chef Soulayphet Schwader pays homage to with these fried balls. The rounds&mdash;flavored with shredded coconut, red curry and fish sauce&mdash;are smashed tableside and accompanied by slices of Kaffir-lime sausage and iceberg lettuce slicked with honey-sambal. 157 Duane St between Hudson St and West Broadway (212-587-1089, kheyo.com). $10. 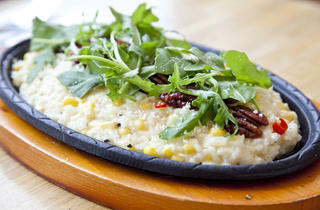 Photograph: Melissa SinclairCharleston Gold &ldquo;risotto&rdquo; at Marietta Craig Samuel debuted this South Carolina&ndash;meets-Italy mash-up in April, using a recently revived Charleston Gold rice from heritage producer Anson Mills. 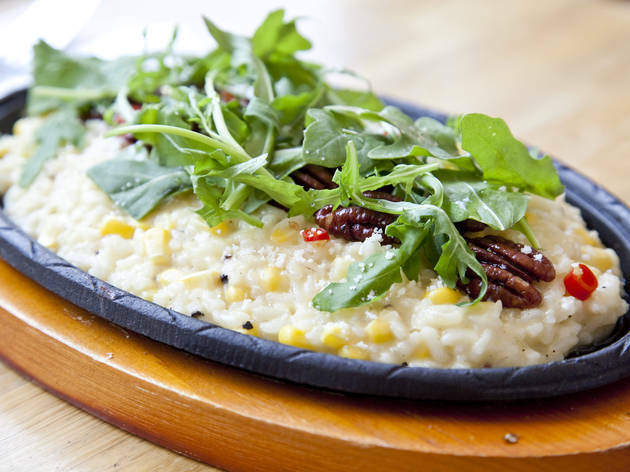 Summer corn and market vegetables brighten the stick-to-your-ribs risotto, while a dusting of aged goat cheese adds a mild tang. 285 Grand Ave at Clifton Pl, Clinton Hill, Brooklyn&nbsp; (718-638-9500, bcrestaurantgroup.com). $12. 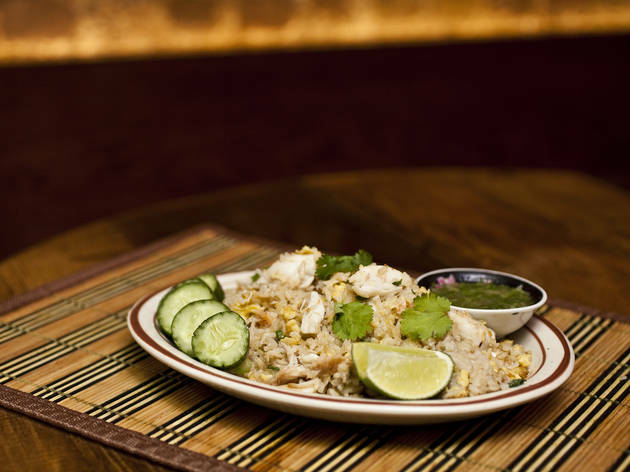 Photograph: Virginia RollisonKao pat pu (crab fried rice) at Uncle Boons To fashion this childhood favorite, Thai native Ann Redding boils, then air-dries jasmine rice till fluffy. 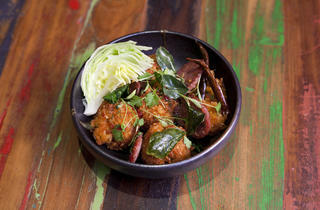 The cloudlike grains are tossed in a flame-licked wok with lumps of sweet crab and garlic, then finished with fragrant cilantro. 7 Spring St between Bowery and Elizabeth St (646-370-6650, uncleboons.com). $25. 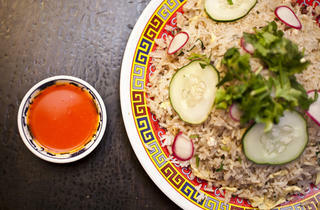 Photograph: Melissa SinclairWok-fried jasmine rice at Nightingale 9 Seersucker&rsquo;s Robert Newton remixes the humble fried rice with a Southern twang, available at his Vietnamese canteen since February. Aired overnight, then cooked in lard, the rice is ethereally light&mdash;jasmine grains mingle with tender soybeans, wilted market greens and fluffy powdered country ham. 345 Smith St at Carroll St, Carroll Gardens, Brooklyn (347-689-4699, nightingale9.com). $9. 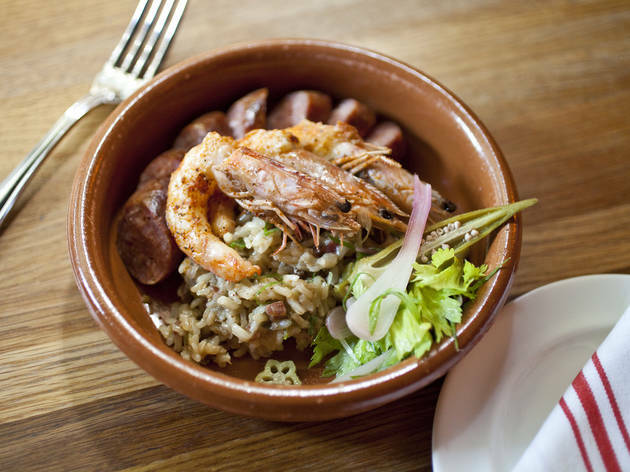 Photograph: Virginia RollisonCajun andouille sausage and dirty rice at The Dutch Chef de cuisine Jason Hua started dishing out this Creole classic in May. 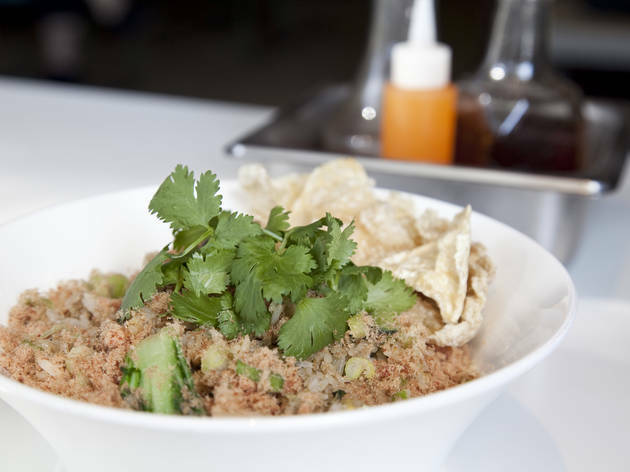 Along with sweet head-on shrimp and smoky pork sausage, Hua&rsquo;s take employs nutty Cajun Grain brown rice, cooked al dente to retain crunch. 131 Sullivan St at Prince St (212-677-6200, thedutchnyc.com). $17. 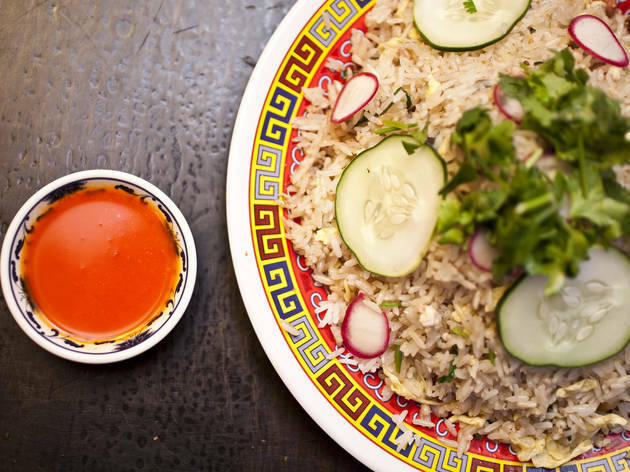 Photograph: Virginia RollisonChicken fried rice at Mission Chinese Food Danny Bowien&rsquo;s salt-cod fried rice was a 2012 gastronaut favorite, leading Bowien to add a full rice section to the menu this year. 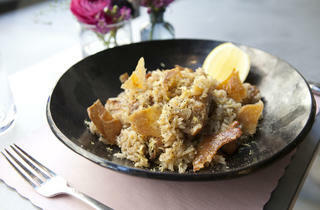 A Jewish-inflected chicken rendition ($13) combines pillowy, ginger-flecked kernels with schmaltz, livers and hearts. 154 Orchard St between Rivington and Stanton Sts (212-529-8800, missionchinesefood.com). $13. Photograph: Jessica LinArroz con pollo at ABC Cocina For chef Ian Coogan&rsquo;s arroz con pollo, chicken cubes and jasmine kernels are first saut&eacute;ed with an onion-garlic-and-jalape&ntilde;o sofrito, then simmered in stock to amplify the poultry flavor. 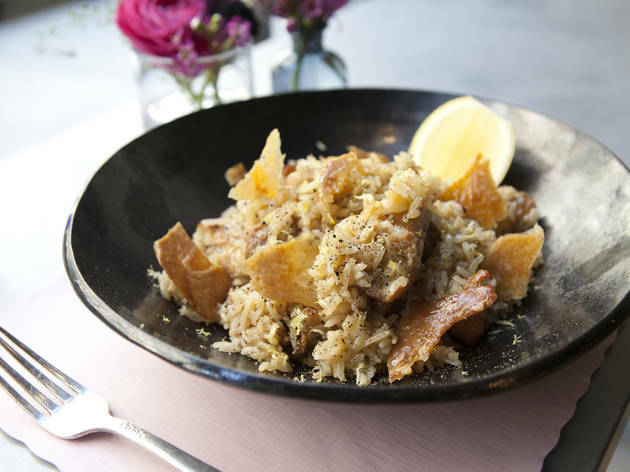 Rosemary adds an extra aromatic punch, while shards of cracklings lend crunch to the bowl. 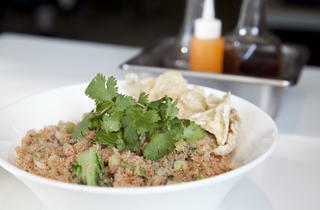 38 E 19th St between Broadway and Park Ave South (212-677-2233, abccocinanyc.com). $22. 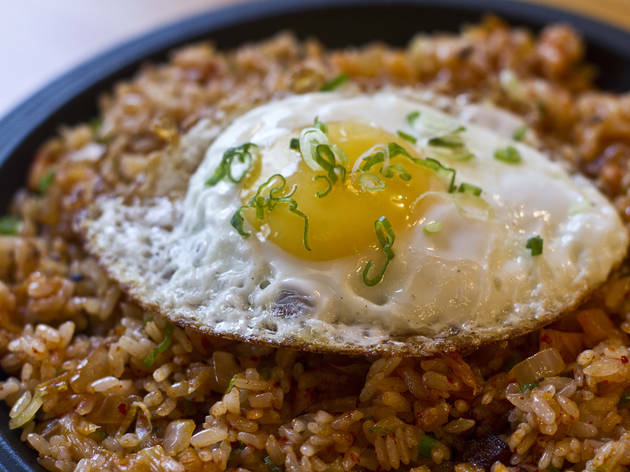 Photograph: Caroline Voagen NelsonKimchi bacon spam paella at Danji In March, Hooni Kim added a new ingredient to his popular kimchi paella: Spam. The iconic canned meat&mdash;a staple in Korea since it was introduced in the 1950s by American soldiers&mdash;imparts a salty-sweet flavor to the glutinous short-grain morsels. 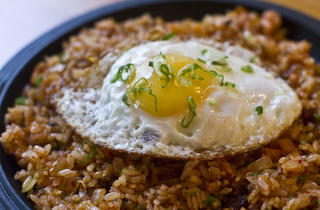 An oozing fried egg crowns the sizzling rice, spread thin on an iron skillet for a crisped bottom. 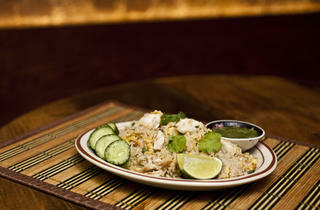 346 W 52nd St between Eighth and Ninth Aves (212-586-2880, danjinyc.com). $18.